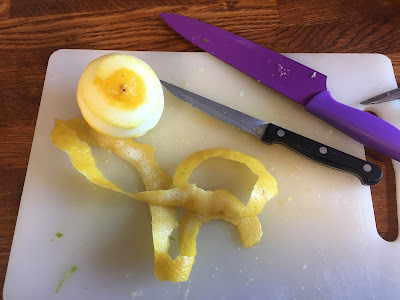 Prepare the fruit as in either of the previous recipes - Thick cut marmalade or Thin cut, Lemon shred marmalade but then peel and bruise/crush the root ginger or chop or slice it and tie in a muslin cloth and add to and boil with the fruit pulp. After boiling, remove the ginger and strain the pulp and proceed as previous recipes. and add to the fruit juice once the sugar has dissolved, and keep stirring for a few minutes to ensure that sugar adhering to the ginger has dissolved, then bring to the boil until setting point has been reached. Leave to cool for a few minutes and then stir to ensure an even distribution of peel and ginger. Pour into jars and seal. If the mixture is too hot when you pour into jars there is a risk that the ginger will sink to the bottom. If this does occur, stir the contents in the jar before sealing. * If you want only a hint of ginger use the lower quantity. If you want it fiery increase the quantity to your own taste. You don't have to limit it to 8oz/200g. Basically this is the same recipe as the previous one but with very thin pared peel and none of the flesh in the final product. Thinly pare the peel with a sharp knife or vegetable peeler. I used a vegetable peeler. Put the peel in a pan with 1 pint (600mls) water, bring gently to the boil and simmer for 20 - 30 minutes. Meanwhile roughly chop the peeled fruit and place in a large preserving pan with 5 pints (3 litres) of water. Ensure you include all the pips, pith and juice of the peeled fruit. Drain the peel and set aside, reserving the liquid which should be added to the fruit in the preserving pan. Bring to the boil and simmer gently for 1 - 2 hours. Pour the liquid into a preserving pan, warm gently adding sugar (1lb/450g for each pint/600mls of liquid) and stir until all sugar has dissolved. Add the drained peel and bring rapidly to the boil and keep boiling until the setting point is reached (see previous recipe). Allow the pan and contents to cool a little, stir to ensure that the peel is evenly distributed then pour into sterilised jars and seal. Lemons were slightly more expensive at 2 kilos for 1€ but at that price we had to bring some home. But what should we do with them? 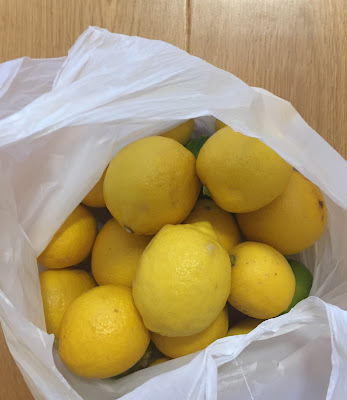 We could slice them and freeze for use with Gin and Tonic - but that's a lot of G'n'T....and we have enough Preserved Lemons to last us well into 2018 and almost everyone on our Christmas gift list has already had a jar - so we decided to make lemon marmalade. 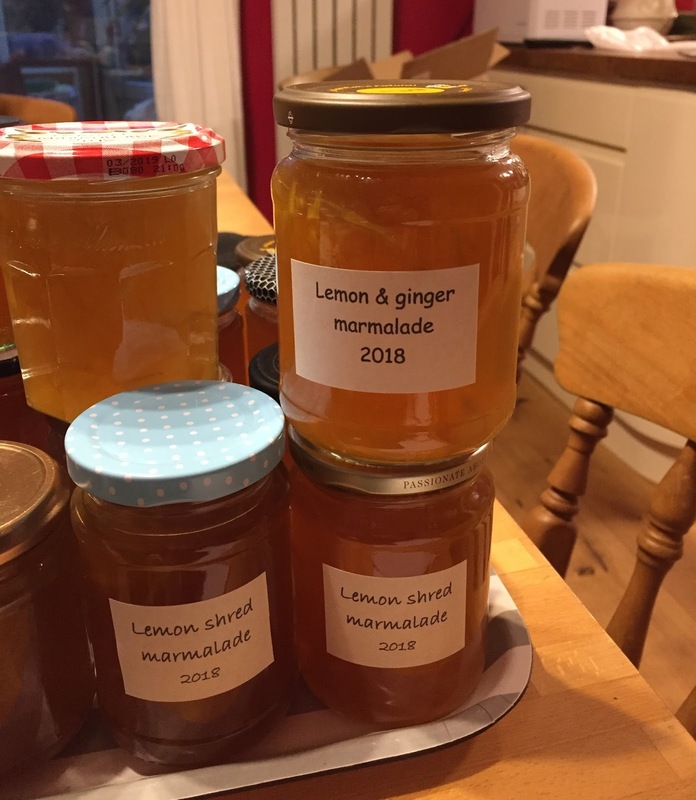 It's a long time since I made marmalade so I consulted a few recipes to get the proportions right but in the end the important rule to remember is 1lb of sugar to 1 pint of juice for us pre-metric generation (that's 450 grams of sugar to 600 mls of fruit juice). In the end I decided to make clear marmalade with peel, adapting a Lemon jelly recipe. We had almost 3 kg lemons and as I also had a couple of spare limes, added these to bring the total to 3 kg. 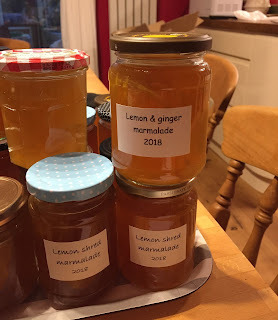 I made 3 batches - the first thick cut marmalade and then one with shredded peel and the last with added ginger. 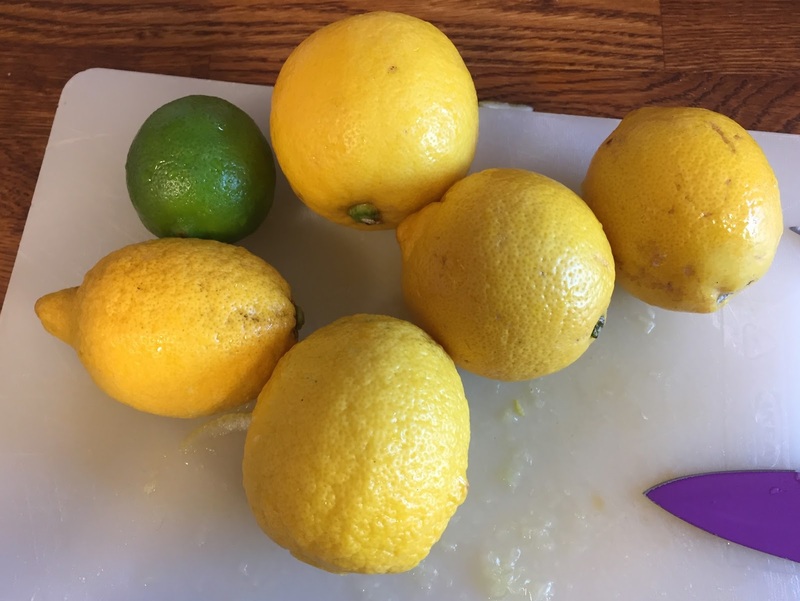 Cut the lemons lengthwise into quarters. Remove any stalk and trim the ends. Remove any stalk and trim the ends. Remove the central core (I find this easy with a sharp pair of kitchen scissors). Remove all the pips. Keep all of the trimmings and central core that you have removed and put in a large preserving pan with 3 litres (5 pints) of water. Boil gently for about 1 - 2 hours then leave to cool. 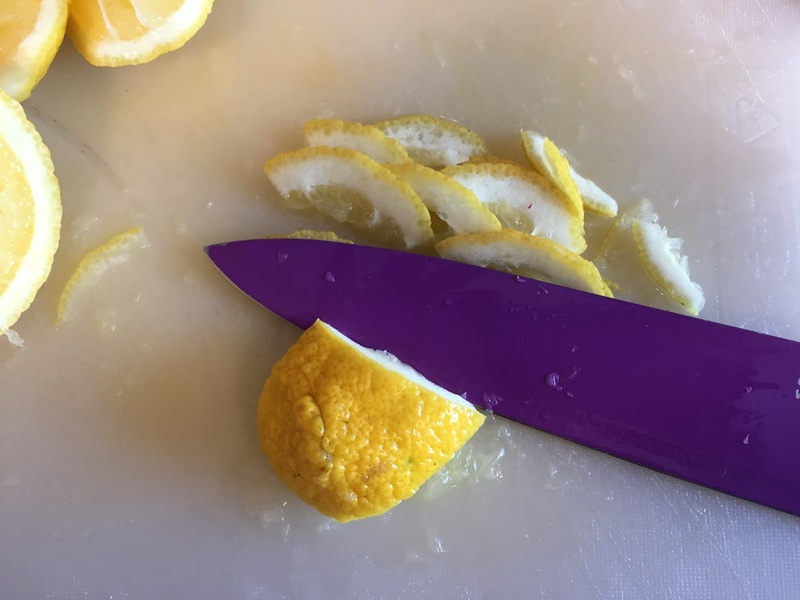 Take the lemon quarters and cut the peel with any fruit attached into slices - as chunky or as fine as you want. Place this peel in another saucepan with 600 mls (1 pint) of water and boil for about half an hour until the peel is soft. Strain the peel, preserving the liquid which should be added to the preserving pan containing the pips and core. When the large pan has been boiling for 1-2 hours, pour contents into a jelly bag and strain for at least 6 hours or overnight. Discard the contents of the jelly bag and measure the quantity of strained liquid. Heat the pan gently and stir in the sugar - 1 lb / 450g to every 1 pint / 600mls juice - continue stirring until all the sugar has dissolved. Heat to boiling and then fast boil until a set is obtained (probably about 15-20 minutes). Watch the pan all the time and adjust the heat as necessary - the marmalade could froth up and spill over if you are not careful. Test for a set by putting a few drops on a cold,dry plate and see if a skin forms - if not boil a little longer and test again. When the setting point is reached, leave to cool a little for a few minutes and stir to ensure the peel is evenly distributed. Pour into clean sterilised jars and then screw on the lids. Leave to cool and set overnight. Enjoy on toast with afternoon tea!